I love the 24 tags of Christmas you do. These are beautiful, as always. Thanks for sharing! So cool and relatively easy! So much so I bought the pinecone stamp so I can try. Thanks for the inspiration. Happy Holidays! I think this one might be my favorite of all the tags you made – just so quiet and peaceful. I think we need more of that at this time of the year, yes? Thank you! This one is lovely! You make creating art into magic! You know what fascinates me the most about watercolor, it’s that you start off with such a ‘hot mess’ and then magically, it transforms into a piece of art! I’ll never tire of that! Beautiful tags, as always, Sandy. I appreciate the education & encouragement! Wow! These are beautiful and so realistic! Love the detailed touches you add to the pine cone! Oh gosh. These are just lovely! The card is divine as well! Don’t know how you do it every time, your talent with watercolours is fantastic. 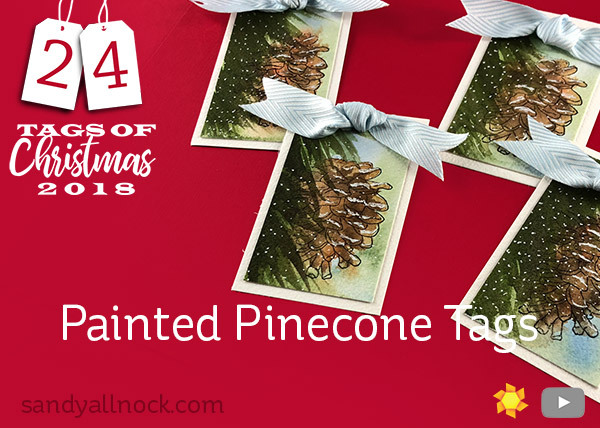 I touch paint to paper & get mess you get pinecones. Card is stunning too. Thank you for all the much needed advice. These are very pretty! I love the loose watercoloring. Thanks for the video tutorial. I am always looking for tutorials on watercoloring images and this was very helpful. I hope I win one of these so I can see it close up. Oh Sandy I love these tags. thanks so much for the chance to win. I have only just found you a couple of months ago but watch every utube video that you send out. Your very talented and you make it all look so easy. thank you again for sharing your talent! Beautiful tags. Simple, but beautiful. Happy holidays, Sandy!!! Great tags! I love watching you watercolor. Your are an amazing water color artist and make it look so very easy. These are very special little works of art. Beautiful tags. Love the one with the red ribbon. Absolutely gorgeous! 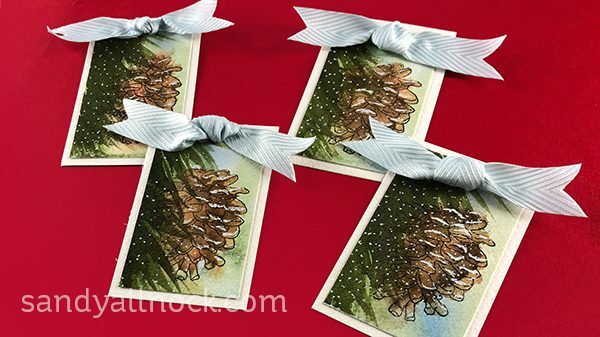 Love these pretty pinecones! Thank you for filming your process. These are amazing! This is my favorite of all the tags you made this year! Just so nicely done! Wow this came out so good, it was hard for me to picture how it got so beautiful as you were going along, I’m always amazed! Very pretty, although I do not know how to water color I love watching your water color videos and seeing your work in water color. It’s an amazing talent and inspires me to try to learn how. Thanks for sharing! Love the snow on them. Wow, Sandy these are just stunning. My husband planted a pine tree for each of our children the summers they were born, (36 & 33 years ago). That is what always comes to mind when I see anything pine related. These are truly stunning, I enjoyed watching your process. I’ll have to admit I was a little bit apprehensive that this was going to turn out looking like anything, but wow! I love watching you work! I so admire your work. You are my reason to paint and create. Thank you for all the wonderful ideas. The pine cone is my favorite. It was fascinating to watch you apply color so randomly and end up with something this pretty….one of my favs! This is one of my favorite. Can’t wait to try it. I’m always timid with dark colors but the contrast really looks great!! 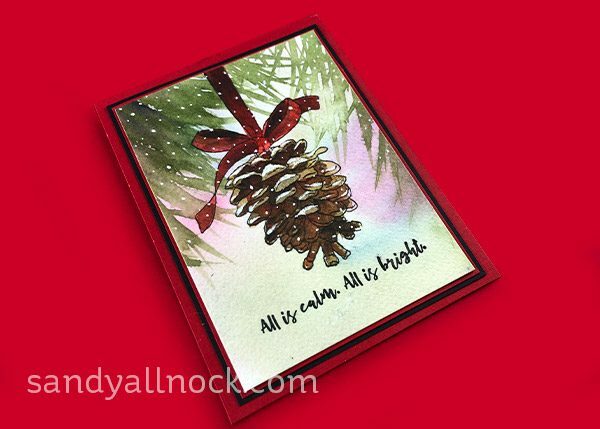 So pretty; there is something I just love about pinecones and evergreens this time of the year! Your art is the high light of my day. These are are wonderful. thank you for sharing. Tags are pretty, but I love the card. I think it’s the pop of red from the ribbon. I’m sorry if this is a duplicate comment. Cant remember if I commented yet but I really enjoyed your video. The snow on the pinecones looks so real! amazing looking pine cones. and watercolored? thanks as always for sharing. You make it look so simple. Beautiful tag!